Byerly Nissan wins the 2017 Dealer of the Year Award from DealerRater January 27, 2017 - Las Vegas, NV -- The team at Byerly Nissan in Louisville, Kentucky is delighted to have earned a prestigious 2017 Dealer of the Year Award from DealerRater, which indicates broad customer satisfaction. DealerRater has an audience reach of more than 40 million consumers who read more than 3 million dealer reviews. Each year, DealerRater examines the reviews attributed to hundreds of dealerships throughout the country in order to ascertain which ones have provided the highest level of service to their customers. "We are so proud of our outstanding team at Byerly Nissan. Our passion to provide exceptional customer service is the driving force in everything we do. We strive to serve all our valued customers with the best products, service and a dedication to excellence that has been the hallmark of the Byerly organization for over 70 years." said John Daunhauer, Vice President of the Byerly Auto Group. To qualify, dealerships must have a minimum of 25 reviews on DealerRater.com (including one from each quarter of the year), must not have been blacklisted during the previous 12 months, and must possess a minimum 4-star overall rating. Once acknowledged to have met these criteria, each dealership is assigned a PowerScore based on both their average rating and the number of reviews provided. Exceptional entries are given a coveted Dealer of the Year Award. Customers are famously more likely to go out of their way to leave a bad review if they are not completely satisfied rather than supplying a positive one if every need is catered to, so a dealership must rise well beyond the ordinary in order to be honored. Byerly Nissan has a phenomenal number of shining testaments, the following are just some of the over 347 reviews. "We've purchased 3 cars from this dealership. It does NOT get any better. The car buying process is actually painless... which says a great deal about these folks. They are honest, easy-going, and knowledgeable. It's truly a pleasure doing business here." "I believe I'm on my 7th purchase at Byerly! No place else to go for a car. With 4 kids (3 driving already), I'm likely to be back again soon! Bob Steffan was easy to work with. Keep up the great work." Byerly Nissan emphasizes customer care over traditional, high-pressure sales tactics. As a result, people from all over Louisville and the surrounding communities return to them again and again for all of their automotive needs. Byerly Nissan is located at 4027 Dixie Hwy, Louisville Kentucky, and is part of the Byerly Auto Group of Dealerships. "It's Our Way of Saying… Byerly Cares!" We've always been involved in charity events. As a locally-owned, family-owned business, it renews our sense of excitement and responsibility to give back to this community that has supported us for decades. Byerly Nissan in Louisville has joined Nissan and Wounded Warrior Project® (WWP) to help raise funds in support of WWP's 20 free programs and services that assist wounded veterans, their caregivers and families. Nissan North America was recently named the official automotive partner of WWP, building on an existing platform of support between the company, its dealers and the well-known veterans support organization. One hundred percent of the funds raised by Byerly Nissan will go directly to Wounded Warrior Project. "We're proud to welcome Byerly Nissan to our list of dedicated dealers that are helping support our nation's heroes through local promotions and events," said Fred Diaz, Senior Vice President, Sales, Marketing & Operations, U.S.A., Nissan North America, Inc. "It's an invaluable way to honor the service to those who sacrifice so much for all of us, including their devoted family members." Byerly Nissan is also continuing to offer special vehicle savings to active duty, reserve, retirees, and veteran (must be within 12 months of active duty) U.S. military, as well as their spouses or domestic partners, through Nissan's Military Vehicle Purchase Program. Byerly Nissan is located at 4027 Dixie Hwy, Louisville, KY 40216. For more information, please contact (502) 448-8222 or www.byerlynissan.com. Congratulations to Micha Jones our newest Nissan Master Technician. (photo) - Micha Jones receives his Nissan Master Certified Technician plaque from Fariborz Nour, Nissan North America, District Parts and Service Manager and Don Creason, Byerly Nissan Service Director. To achieve the level of Nissan Master Technician, each technician is subject to intensive Nissan specialized technical training in order to achieve true mastery of maintenance and service for each vehicle within the entire Nissan 15-car product line. It takes a minimum of five years to achieve Nissan Master Certified status. To be recognized with this title, one must take all the required Nissan courses and yearly product Orientation classes. Master Technicians must first achieve certification as an ASE Master Technician. They then must attend hours and hours of classes in each individual Nissan model, as well as, each automotive component, such as electrical, braking systems including engine, electrical, driveline, chassis, and much, much more. Because of all the time required at Nissan School and away from the dealership, becoming a Nissan Master Tech requires quite a commitment on the part of the individual as well as the Dealer. "We are all very proud of Micha and his tremendous accomplishment. Micha joins our other Master technicians not only with his expertise, but also with his commitment to the highest standards of quality" said John Daunhauer, Byerly Auto Group Vice President. After taking the required classes, the candidate must pass a lengthy series of tests. So congratulations are in order to our newest Nissan Master Tech, Micha Jones! Three generations of the Daunhauer family have owned the Byerly Auto Group, located in Louisville, Kentucky. And in another long-standing family tradition, the dealership has made donations to a nearby charity for more than two decades. The business and the organization, Shively Area Ministries, or SAM, share more than a ZIP code, said Byerly Auto Group president Greg Daunhauer who serves on the SAM board. The organization is one of 15 groups that are part of the Association of Community Ministries in Louisville. SAM and the other 14 groups offer food, utilities, prescription medication, rent assistance and other emergency financial assistance to those in crisis or poverty situations. Employees of the dealership also distribute food at the Shively Area Ministries food pantry and adopt families served there during the holidays by taking up donations of food and money as well as and shopping for gifts. Daunhauer said that 1,653 children and adults were assisted by SAM at Christmas time last year. The dealership has provided Shively Area Ministries with a van and performs the vehicle's ongoing maintenance and repair at no charge. Daunhauer said the good works performed at Shively Area Ministries are numerous and really make a positive difference. Last year, 209 people received helped with utilities, more than 13,000 received food, and 1,420 people received clothing. Byerly's donation allowed for the expansion of Shively Area Ministries' food pantry to better serve the growing demand for assistance. For 12 years, thousands of pounds of food were stored off site in an older, three-story farmhouse owned by Shively-based St. Stephen United Church of Christ, said Shively Area Ministries executive director Roxanna Trivitt. As a result of the dealership's donation, 1,500 square feet have been added to Shively Area Ministries' facility. The new portion features a garage door that allows for unloading food for the up to 50 families per day served by the food pantry. The fact that the food storage is now on one level is much easier, especially since the new area has a large door to accommodate food delivery and drop off of donations, Trivitt said. When the organization needs assistance to help others in the community, Byerly Auto Group delivers, Trivitt said. "I just call them a shining example of caring for the community in which they're doing business." Byerly Nissan is a premier Nissan dealership located in Louisville, Kentucky. They are the number one volume selling Nissan dealership in the Metro Louisville area. Byerly Nissan is part of the Byerly Auto Group which has served the Louisville area for over 65 years. 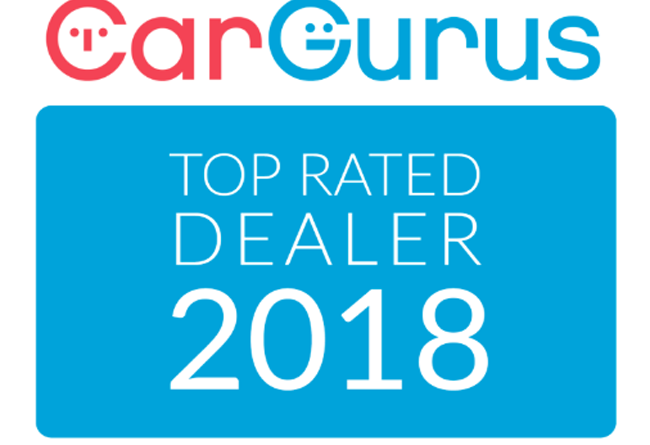 They are also the recipient of numerous customer satisfaction awards..
"Only the best-reviewed dealerships receive the CarGurus Top Rated Dealer award" said Sam Zales, President, Dealer Operations for CarGurus. Mr. Zales went on to say "We are excited to recognize Byerly Nissan in this category of top performing dealers who share our commitment to building a transparent shopping experience." John Daunhauer, Vice President of the Byerly Auto Group said the dealership was honored by this prestigious recognition. "Everyone at Byerly Nissan is thrilled to be recognized as a CarGurus Top Rated Dealer. Each and every day our goal is to bring our customers the highest quality products and to back those products with exceptional customer service. We thank all of our valued customers for their continued support and for allowing us to serve them." CarGurus has over 6 million consumers visit their site each month to shop for a new or used car. CarGurus uses mathematical algorithms to analyze the available vehicles and then rank the listings from best to worst. CarGurus is based in Cambridge, MA with a board, and management team that include current and former senior executives from Ebay, Expedia, TripAdvisor, Edmunds.com and Yahoo.